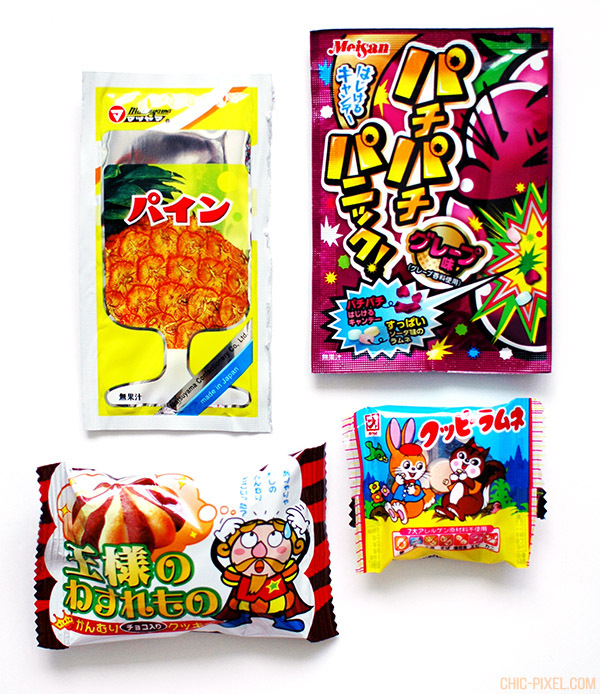 Dagashi, or cheap Japanese snacks, are often passed over by international Japanese snack fans in favor for more famous snack products like Pocky, Pretz, and Japanese Kit Kats, but Japan has a long history of fun, colorful snacks and the mom-and-pop stores that carry them. 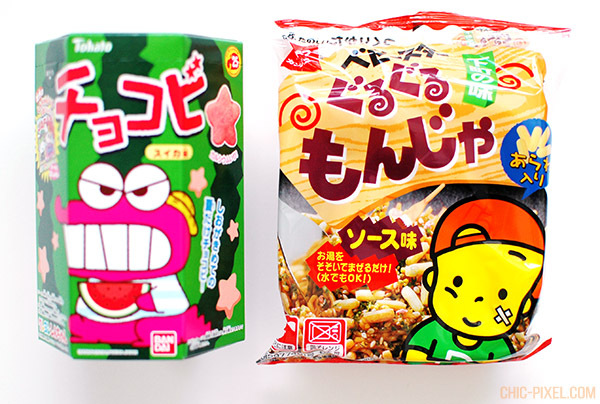 Thanks to anime like Dagashi Kashi, more people are getting interested in these classic Japanese snacks, and to help spread the dagashi love, OyatsuBox has packed their July subscription box full of all things dagashi! 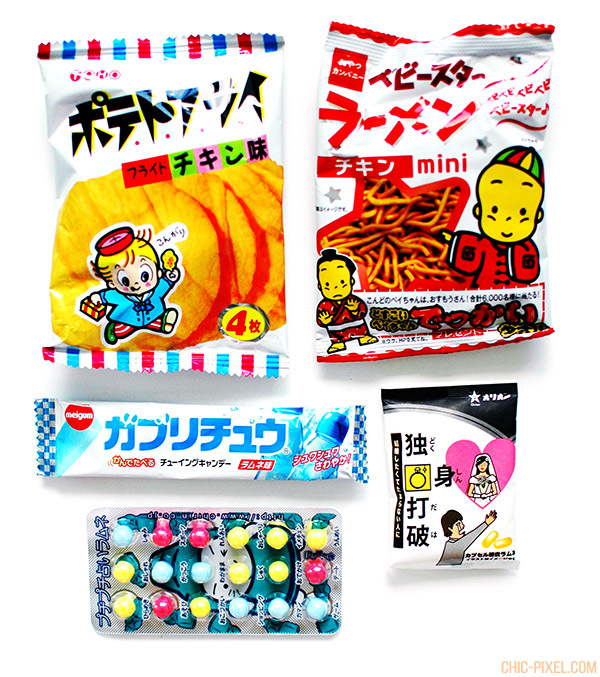 Out of the items in this picture, I’d already tried the Babystar Original ramen bits (top right) and Ramune fortune-telling candy (bottom left), but everything else was new to me! 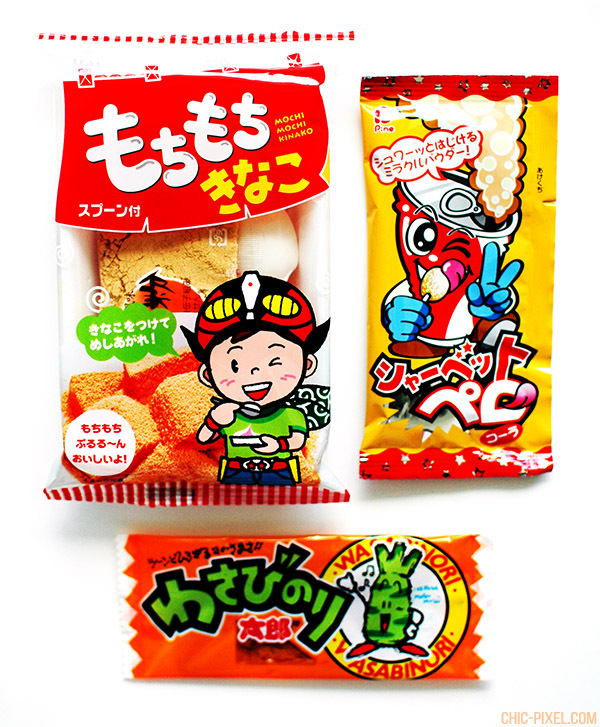 My favorite was definitely the chicken-flavored crisps at the top left – they’re called “potato chips” on the packaging, but the OyatsuBox pamphlet lists them as senbei, so I’m not really sure what they are! They were large and thin and had a great flavor, though, so I won’t worry about silly details like knowing exactly what I’m stuffing in my gob. Despite knowing a few of the items in the first batch, I was completely unfamiliar with everything pictured here! I love the packaging on these ones, and I can’t wait to try the chocolate cookie in the shape of a king’s crown on the bottom left! Despite not always having an appetite for sweets, I managed to quickly wolf down all of the Umaibo items in this picture. The pizza Umaibo in the center are always a classic, but I’d never seen the takoyaki Umaibo on the left, or the premium wagyu Umaibo on the right! Both were delicious, but I especially liked the slight kick of wasabi in the premium wagyu Umaibo. More wasabi! Despite having tried Nori Taro before in a previous subscription box, I’d never tried this wasabi version at the bottom of the photo. I still can’t decide if I really like Nori Taro’s slightly fishy taste, but the wasabi definitely made it more appealing! 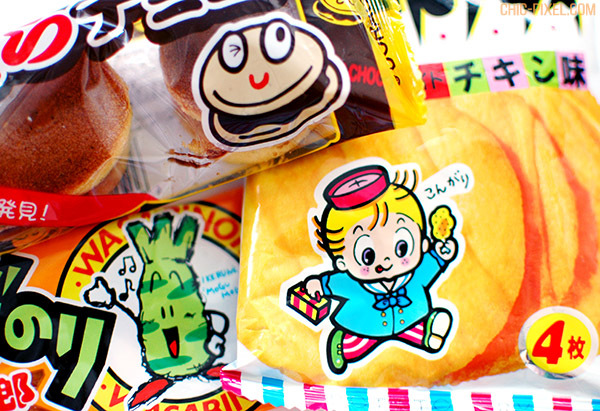 That adorable character on the package definitely helps, too. I haven’t had a chance to dive in to the kinako mochi at the top left yet, but I love anything mochi-related, so I’m sure I’ll love this too! I love Babystar Monya (item on the right), so I was thrilled to see it in the July OyatsuBox. This requires a little work in the form of boiling water, but mix it in and you’ll be greeted by a tasty noodle treat! On the other hand, I always find Chocobi, the item to the left, to be a little too sweet for me, despite the adorable packaging. This one was watermelon flavored, but still not my favorite. Finally, the Dora Choco pancakes with chocolate had one of the most adorable packages of the lot, and was tasty, to boot! 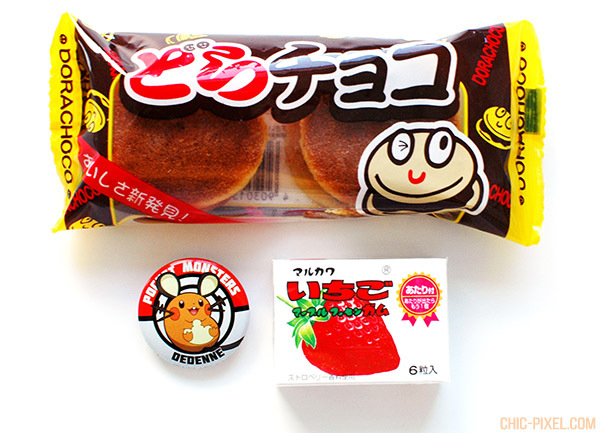 The box also came with strawberry gum and a Pokémon pin gachapon. I was so excited to get Dedenne! What a cutie! 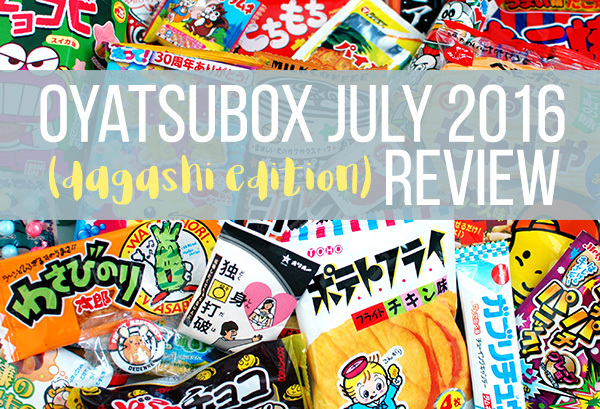 Before closing out my review of OyatsuBox’s July dagashi box, I had to include a photo of my favorite cute characters from the items included this month! Aren’t they brilliant?! Petition for everything to have a cute mascot character, please! 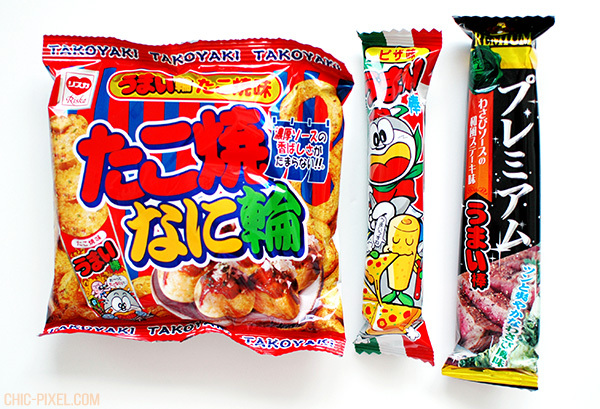 As always, OyatsuBox delivered an amazing selection in their Premium snack subscription box. While not every month has as many items as this due to dagashi being much cheaper than more popular snacks, I can’t wait to see what goodies are in store for next month. If you subscribe now for the next box, you’ll be just in time for the full-size Pokemon figurine coming in September!